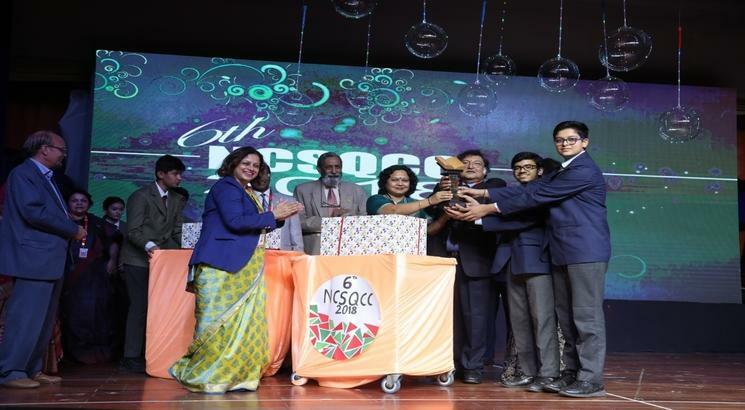 The ‘6th National Convention on Students Quality Control Circle (NCSQCC)’ by Suncity School, Gurugram concluded recently amidst much enthusiasm. The Chief Guest in the event was Sugata Mitra, Education Researcher and Ted Talk Speaker. One of the key dignitaries on the occasion Rahul Bose, the famous actor and director called upon the students to have faith in themselves and to listen to their own gut feeling to overcome the obstacles. He spoke in detail on how difficult times can teach one to rise above criticism and negativity. Rupa Chakravarty, Principal, Suncity School, said “Quality is not an act but a habit. And we have imbibed that in our students by constantly walking the talk and showing them through role models what is quality. If we want them to have quality then we have to show them quality. This convention was a good platform to showcase that what quality means and help them benchmark themselves”. The two days extravaganza hosted 8 events in which 400 students from schools across the country like City Montessori School- Lucknow, Strawberry Fields- Chandigarh, Blue Bells School – Gurgaon showcased their problem solving abilities, analysing and research skills. The delegates also presented their research papers in the convention. The other dignitaries present were Dr Jagdish Gandhi, Chairman, World Council for Total Quality and Excellence in Education, Madhukar Narain, Chairman, Mauritius Students Quality Control Circles and Siddhart Basu, the father of Indian Television Quizzing. Sugata Mitra, presented the awards to the winners of the convention. The best team trophy of the convention was clinched by Raman Munjal Vidya Mandir and the runners-up trophy was bagged by Suncity School. Students of Suncity School also presented an aerial act as a part of the cultural evening for the guests.